mossy shed is filled with joyful decorations in anticipation of the arrival of my folks today, Our #2 on saturday and Our #1 on sunday. to have my clan altogether for christmas has me giddy beyond giddy. has been so many months since i saw them last, this past week i have not dared think about my girls coming home, for when i do, i well up inside and feel my mothering heart beating. come the 25th we will celebrate christmas, on the 26th we will celebrate Our #1 turning 20 and on the 27th we will celebrate Our #3 turning 16. yes, it is quite true to say, there are many reasons to be in celebratory mood in our shed over the coming days. starting my cadbury's chocolate advent calender on the 10th of december and finishing it all by the 12th. i have always wished to do such a thing, and felt being aged 43 it was high time i did such a risque thing in my life. it was two whole days of pure guilty joyfulness and i plan to do the same again next year. despite my children's grandfather (my man's father) being so terribly poorly over the past few months, with the devastating affects of cancer, this christmas we will be celebrating all the wonderful years and times shared with him and indeed be joyful of those memories. i struggled to find this silver lining, but after the sadness which has engulfed our lives since september, it was important to look for it, i hope you don't mind. i know this will be the year i look back on when old and crinkly in my rocking chair and marvel at how an indie publisher and crafter collaborated upon a book and how many folks embraced the results. leaving me thankful and joyful. despite my sweet Used Dog not being granted a 'clean bill of health' i am so joyful to be told we have bought her more time on this earth. for now my constant canine companion is feeling perky and happy after several tough weeks. i do not know how long we have left together, the future is not ours to know. but what i do know is, every day i have my friend by my side will be a joyful day until we come to say our goodbyes. thinking ahead to the new year and my resolution. this past year's resolutions have gone rather well and so i am optimistic for next years. that being said, i have aimed high and i fear it may be 'pie in the sky' high, but i must try and try i will. after refusing to shop for groceries in Target because it just didn't feel right, i broke down on tuesday evening and ventured into the food aisles where upon i discovered the most peachiest shortbread cookies with itty bitty chocolate chips in. having eaten half the container yesterday i fear i am too weak in the willpower department (please see joyful thing two) to not succumb to their alluring charms in the cupboard. it is not a good sign when you wake up the next day at 6:30am and within a few minutes wonder to yourself when is an appropriately okay time to have another cookie. whilst wondering about cookie eating appropriate time, a crafting epiphany hit me this morning, like a little lighting bolt out of the blue, the cogs started turning and i realized seeing january looming and a half empty shed again, isn't looking quite so bleak after all. taking a little time off until mid january and using that time wisely to make things, to twiddle with things and to figure some things out. yes making, twiddling and figuring will be a wise way to spend time over the coming weeks. 2: when you have fully clothed your branch and it is most pleasing to your crafty eye, perhaps you may care to add a little bit of lace here and there, or perhaps not. i shall leave that up to you and your branch to decide. 3: next, cut a length of your hardy twine, ric rac or narrow lace which is befitting to how low you wish your branch of joyfulness to hang. tie either end securely to the ends of your fabric wrapped branch, i am thinking 'boy scout securely' here, for things may get a little weighty. how joyful is your branchiness"
for the 10th day i thought it might be quite jolly to share three crafty souls who are most peachy. each of them very different in their own styles, each of them most gifted in their talents and each of them with books filled with crafty goodness. most worthy of a wish list or two. Pip and i share a love of the three C's. crafting, crocheting and clogs. i think it true to say we also share a love of crafting for the pure joy of it. i'm a huge admirer of Pip and her crafty soul, she inspires crafters across the globe with her happy joyful crafty soul, generous spirit and i admire anyone who says they do not care what others may think of what they make or the colours that they choose. i think at times when i am fretting about my yarn colour choices i need to channel my inner Pip and fret not. Pip has quite a few books out and i believe more on the go. her recent one when i saw the cover just made me smile, it made my little crafty soul warm up and wish to get busy. that is what i love about Pip and her books. they make me feel its okay to have a love affair with stickyback plastic and twigs. yes, this is the book for you, if you love happy, jolly crafting. this is not rocket science crafting, in fact truth be told, most of the 12 days of joyfulness have not been, but that is a-okay with me, for this time of year i do believe easy peasy things to craft, are the way to go and there is nothing more easy peasy than these little strings of joyfulness. 1: if you have some vintage paper doilies or paper coasters in your stash, yipee! if not, then cut some circles out of your scrapbooking paper or christmas cards. i actually don't have any scrapbooking paper but i have noted upon pottling around our local craft store that there is a wealth of fabby papers and some would be most suited to this little string. 3: start a chain with your hook and string, (if you cannot chain, do not fret, i'll suggest something in a mo.) here you need to decide if you wish things to be even or a little odd in their placement. i decided i wished not to be 'a little odd' today which makes a change. after you have chained a while, add your first circle by slip stitching through the punched hole and continue upon your chain-y way for as long as you wish your little string of joyfulness to be. if you do not chain, then just cut a length of string to your liking, then cut little short strings and attach to your circles (a bit like a gift tag tie) and then attach to your long string. question: when is a stool not a stool? yes indeedy, if like me, your coffee table has been commandeered into holding a christmas tree and you have a shed load of clan for the joyful season, it is quite possible you maybe lying awake at night fretting as to where folks will put down their little plates of nibbles or indeed their little tipple of sherry. fret not my dearest readers! for fretting has been banned. instead, find a passing wooden stool, perhaps one that has lurked unloved for sometime under a pile of crappity crap and make it feel loved and joyful again. for after all 'tis the season of goodwill towards all men and i do feel stools should be included. 1: look at your stool, decide if it requires a coat of jolly paint, if so, prepare with a bit of sanding and several coats of glossy paint with your handy dandy paint brush. twiddle your thumbs whilst waiting. 2: for the little top, you can use either stickyback plastic (yipee!) like me or wallpaper. (i have been looking for an excuse to use more faux wood stickyback plastic ever since this table got the treatment.) on the reverse of your plastic paper or wallpaper, place your stool upside down and draw around it. cut out your circle and test it on the top of your stool. it may need a spot of trimming or you could wait and do it a bit later. 3: peel the backing off and carefully place your stickyback plastic on top your stool. if using wallpaper, paste the back of your circle of paper with mod podge and carefully press in place. smooth out all bubbles and keep pressing firmly so everything is nicely adhered. trim now if need be, but do be careful as the paper will be very easily torn at this point. if using wallpaper and mod podge wait for it to dry. more thumb twiddling i'm afraid. 4: add your decals if you so wish (please see 'day 6 of joyfulness' for decal ideas) according to the instructions of your decal paper. press firmly and wait to dry. 6. place your handy dandy side table/tables somewhere handy, and when the time comes this joyful season and you have folks with nibbles and drinks in hand, whip out your spiffy side tables and their handy dandiness with a flourish and a 'voila'! oh yes indeedy! there is nothing more happy then a few twigs of glee doing their thing on your sideboard at joyful season. i must say i have mine in our little front hallway, on the side with a large mirror behind it, thus doubling the gleefulness of my twigs and causing quite a bit of sparkly-ness with the reflection. however i could not achieve a photo in this bit of hallway so i carried my 'happy happy branch of glee' upstairs, most carefully, to get some photos for you to see. last year, i did a similar happy twig thingy , i loved my branch a whole lot, perhaps more than is healthy to love a few twigs, but i could not help myself for it made me happy. my branch last year was inspired by the fabby december issue of Country Living (UK edition) which my mother kindly sent from across the pond. i recall pouring over that issue and marveling at all the joyfulness which lay within its pages. on one page in particular, a branch sat in a large container and looked perfectly peachy to me and thus i was inspired to make one for myself. this year, i felt a need to make one again, for such is its peachiness (and easy peasy-ness) i could not resist. 1: wrap your jar or container in lace or fabric, pin in place and stitch with a happy coloured yarn or thread. 2: cut and place your foam inside your container or jar (mine held green olives in its former life) so it fits snuggly. push your twigs into the foam and try to arrange in a way such as they have a nice bit of twigginess going on, for dingly dangling things on the branches. 3: to cover the top where you may see the foam, stuff some yarn balls made from your creamy coloured yarn. i have noted small beings or elderly folks are very handy at making yarn balls this time of year. and just a thought, you could paint your twigs if you would rather, painted white may look most spiffy indeed. i have said medium peasy not because these jars are tres tricky but more because they take a little bit of time to do and the decal side of things can be fiddly. this past summer whilst visiting my soul sister Debbie in old blighty, i found myself loitering in her laundry space, after pottling all around her shed to see what was what. upon the side in her laundry space was several old jars, each one containing an interior coat of paint. immediately i needed to do a closer inspection. upon inspection i inquired as to what she was doing. Debbie then told me she was waiting for them to dry, and that was it. our conversation was distracted by other things and i never did find out what she was going to do with her little painted jars. however such was their loveliness and the quality of 'milky glass' which came from having an interior coat of paint, i thought it might be grand to try it myself. and so i did, and i liked it, and then i had to decal them, because i am a decal addict and cannot help myself. option two: to decal! oh yes, 'to decal or not to decal' that is the question and every time i choose to decal! 4: or you could make your own decals. either use your own image or find a peachy one for very little cost like i did from this fabby seller. i had no idea there was such a wealth of collage images available, as soon as i discovered this vintage joyful postcard, i was gripped by the need to make decals. once you have found an image you like, take your decal paper and follow the instructions for printing and be sure to seal your printed image with whatever the instructions on your decal paper tell you. 6: place your little painted, decaled jars in a cluster, do not pay attention to others who may query a need for empty jam jars filled with paint to clutter up the place. no ignore such comments and just rejoice in the joy of knowing what a glass jar saved from the brink of recycling, can bring to a crafty soul. my soul sister Debbie and her handy dandy little painted jars found lurking in her laundry space. yes indeedy, we are back to dingly dangly again today! this is easy peasy and i think most suited to dingly dangling any little happy things, does not have to be just for the joyful season, no indeedy, afterwards you may swap out your gleeful dingly danglies and add some other pretties. a merry mobile for all seasons and one most suited for 'small beings' to make, how spiffy! 1: take your two sticks and holding them in a cross shape, wrap with your yarn or string several times to secure. once again, channeling your inner boy scout might come in handy here. once secure and not wibbly wobbly, tie off your string and cut. 2: wrap the crossed twigs with your strips of fabric, you could use different colours, use a bit of mod podge to keep in place or use a needle and thread just to secure ends. 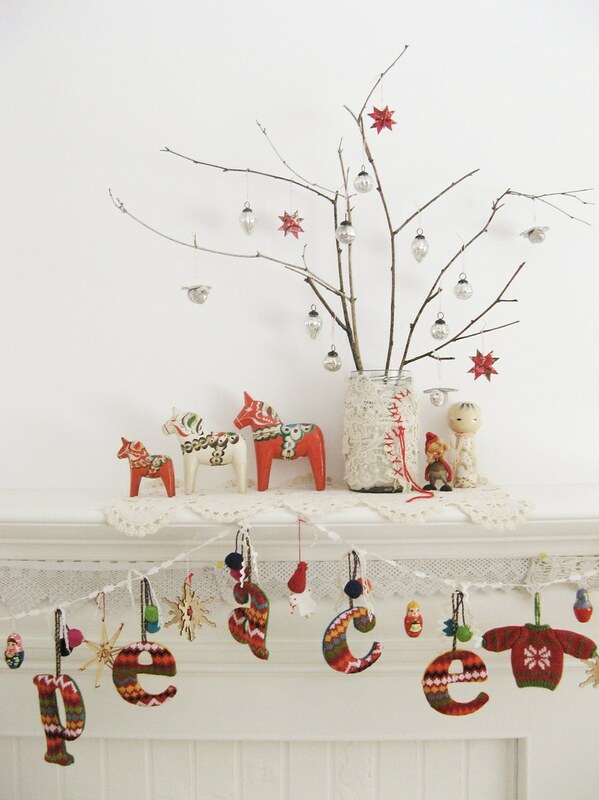 4: hang your merry looking 'sticks and string' up at a convenient level for 'blinging'. rustle around in your gleeful box and start attaching little strings to your sweeties and tie onto your mobile sticks. once again we must think about balance here so it all stays nice and level. i have made mine very symmetrical to challenge myself, for usually i am quite higgedly piggedly with my placement of things, however you are welcome to be higgedly piggedly and i do think you could even be quite 'clustery' as well. i do like myself a new pillow cover however its an odd thing, cos here they call it a pillow and over the pond a cushion, i have often found this particular difference in our language a tricky one, do i say pillow or do i say cushion? for the purpose of today though, we will have to go with pillow because it goes nicely with 'perfectly patched and pieced' and i do like a bit of 'nicely'. envelope back pillow-covers are by far the easiest way of making a cover i believe and if you make it out of one long piece of patched fabric, even more so. you could make this little 'how-to' even more easy peasy, by using one fabric, forgetting about the buttons and loops and literally cut to shape, sew up two sides and voila! it also might be a little noticeable that i have not used obvious 'gleeful' colours, for the very reason i wished to enjoy my new pillow-cover for longer than a few weeks. you could however choose some smashing gleeful fabrics and even go so far as to applique a bit of 'JOY' across the front. i shall leave that entirely up to you. and just a note, i work in inches, i know that is not the norm for most, so just do what you need to do in cms and ignore my inches. 1. measure your pillow insert, you will need to make a piece of fabric which measures the same height as your pillow, plus 1 inch for seam allowance and then a bit more than 2 and a half times the width of your pillow. write down your measurements less you forget. this is where you can just cut one large piece of fabric or gather together a few favorites and start cutting strips of different widths and stitch together. be sure to press the seams nicely. you may also wish to have a little think about the position of your fabrics as to when they are wrapped around your pillow insert, basically thinking about where the blocks of fabrics will lay, for want of a better way of saying it. 3. lay your fabric right side facing up. take one end and fold towards the center of your rectangle, going past the center point. if you have loops, you will need to fold this piece inwards first. then bring over the other end and fold on top. with a tape measure you will need to check you have the exact width of your pillow insert. if it is too small or too wide, then readjust your fabric accordingly. if happy, then pin in place along the top and bottom raw edges and stitch leaving an half inch seam allowance. you may wish to go back over the raw edges with zig zag stitch, but you do not have to.